Plans to build 710 additional homes in the Green Belt in Radley have been unanimously rejected as unacceptable by a packed public meeting of Radley parishioners. 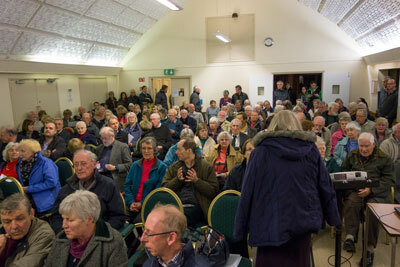 The meeting on 21st March in the Village Hall, was called by the Parish Council in response to the recently published Strategic Housing Market Assessment and Housing Delivery Update to the Vale of White Horse Local Plan, which propose that 710+ new homes should be built in the Radley Green Belt. The meeting was attended by Mike Murray, Cabinet Member for Planning Policy of the Vale of White Horse District Council, who gave a polished, but unconvincing, account of why the new homes were needed in the places where they were allocated (in which much of the blame was shifted onto Central Government); and Helen Marshall of the CPRE, who gave a good presentation of the opposing view, which very much reflected the sentiments of the audience. Questions, mainly directed at Mr Murray, were largely met with unsympathetic intransigence to the effect that this policy was the only way that the District Council could claw its way out of the stranglehold that Central Government policy, in the form of the NPPT, and the Planning Inspectorate, had placed them in. While a public consultation had been opened up, the impression given was that this was very much a fait accomplis with only the possibility of shifting some houses from here to there likely to get any consideration. A straw-poll at the end of the meeting was unanimous in opposing any development in the existing Green Belt. “People are bewildered. This is not the way that democratic government is supposed to behave. The meeting was chaired by Jenny Standen, chairman of the Parish Council. Radley Village Hall, once again packed to capacity by a public meeting, this time to protest about new housing plans.